INGUSHETIA, Russia (November 25, 2017) — Russian challenge Khamzat Dalgiev ended the three-year plus reign of Ivan “Buki” Bunchinger as M-1 Challenge featherweight champion, knocking the Slovakian in the opening round in last night’s M-1 Challenge 86: Battle of the Narts” main event, in Ingushetia, Russia. M-1 Challenge 86 showcased MMA fighters from a dozen different countries: Russia, USA, Slovakia, Finland, Canada, France, Brazil, Kyrgyzstan, Uzbekistan, Ukraine, Azerbaijan and Georgia. 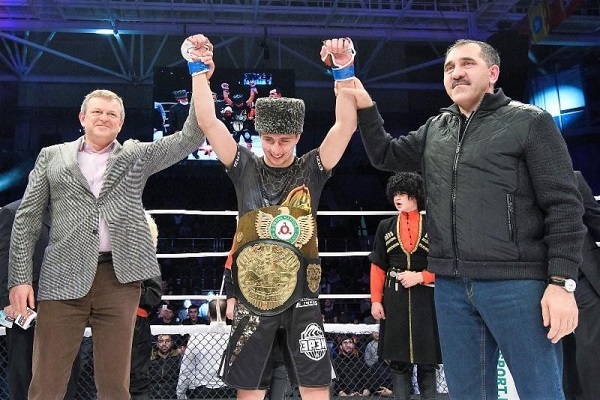 Buchinger (32-6-0, M-1: 7-2-0) originally captured his M-1 Challenge featherweight title more than three years ago, when he knocked out Tural Ragimov in the fourth round of their M-1 Challenge 52 Fight of the Night, also held in Ingushetia. Buchinger had made two title defenses, winning a five-round unanimous decision over Mansour Barnaoui at M-1 Challenge 62 on October 10, 2016, as well as in his last action this past June at M-1 Challenge 80 in China, at which he locked in a choke to defeat Timor Nagibin by fourth-round submission this past June. The newly crowned M-1 Challenge featherweight champion, Dalgiev (10-1-0, M-1: 6-2-0), extended his win streak to 10 consecutive victories since he lost his pro debut. Russian Mikhail Ragozin (9-3-0), M-1: 2-1-0) knocked out American Joseph “Leonidas” Henle (10-3-1, M-1: 1-1-0), who made his M-1 Global debut, on punches in the third round of the co-featured event that was contested at a 196-pound catchweight. Finnish lightweight Aleksi Mantykivi (11-4-0, M-1: 1-0-0) and Canadian bantamweight Chris “The Greek Assassin” Kelades (12-3-0, M-1: 1-0-0) both made strong statements against their Russian opponents in their M-1 Global debuts with submission victories. Mantykivi used a Guillotine choke to defeat Bashier Gagiev (5-3-0, M-1: 2-1-0), of Russia, in the second round, while Kelades employed a Kimura for his win over Russian Oleg Lichkovakha (8-2-0, M-1: 1-1-0) in the third frame. In the main card opener, Kyrgyzstan featherweight) Busurmankut Abdibait Uulu (9-2-1, M-1: 1-0-1) punched out his Brazilian foe, veteran Diego Davella (18-7-1, M-1: 1-2-1), in the opening round. On the preliminary card, Ukrainian welterweight Alexander “Iron Capture” Butenko (45-12-3, M-1: 11-2-1) registered the 45th win of his professional MMA career, when the doctor halted the action after one round versus Elerzhan Narmurzaev (4-1-0, M-1: 0-1-0), of Kyrgyzstan. Georgian featherweight Soso “Stechkin” Nizharadze (5-4-0, M-1: 2-0-0) took a three-round unanimous decision over Russian Adam Gagiev (3-3-1, M-1: 2-2-0), Azerbaijan heavyweight Zaur Gadzhibabyev (6-1-0, M-1: 4-0-0) knocked out Nikolay Savilov, of Russia, in the first round on punches, and Brazilian lightweight Rubenilton “Rubinho” Pereira (8-5-0, M-1: 2-2-0) put Russian Lom Al-Nalgiev (14-6-0, M-1: 5-1-0) to sleep via punches in the opening round. In a pair of pre-undercard fights, Russian bantamweight prospect Selem Evloev (4-0-0, M-1: 4-0-0) kept his perfect record intact, unloading a bevy of punches on Ukrainian Dmitry Orlov (2-4-1, M-1: 1-1-0) for a first-round technical knockout, while Ukrainian Yuri Chobuka (8-1-0, M-1: 2-0-0) improved his record to 8-1-1 with a first-round submission triumph by way of Guillotine choke versus Akhmadkhan Bokov (2-3-0, M-1: 2-1-0), of Russia, at a 150-pound catchweight.